Believe it or not I only recently discovered Fat Quarter Bundles and the wonderful Fat Quarter on-line shop! I love being able to buy a whole fabric line but in a scaled down way. Here is one of the most recent Fat Quarter Bundles I played around with. Just a very simple block but I like the overall look because of how neat the fabrics look together. Not sure what to do with this quilt – just something that was fun and relaxing to make 🙂 I am pretty sure the name of the line is Apple Jack (which also happens to be the name of one of my favorite cereals when I was a kid). 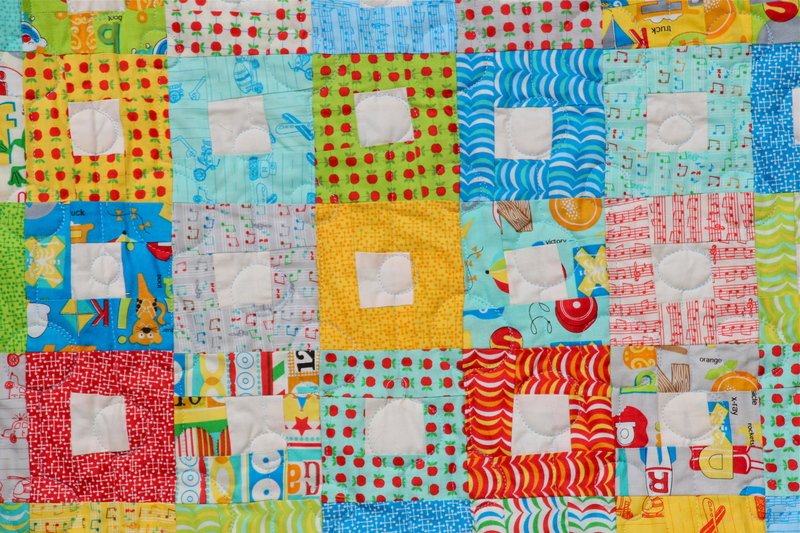 Fat quarter bundles are a great way to play with a line of fabric. I love buying them. Your quilt is adorable. Great job. Love the colours! You chose a wonderful pattern to show off all those bright fabrics. It is a really sweet quilt. Thanks for sharing at the Let’s Bee Social linky, Linda! This is such a refreshing quilt. It makes me happy just looking at the fun, fab fabrics (try saying that 3 times fast!). Great job. Thanks! I have just been visiting your blog and have added your Japanese block tutorial to my list of blocks to try. I have just the fabric bundle for it too – Kate Spain’s daydreams. I think that would work really well with your block. I am currently working on a simple quilt using Amy Schimler’s new Jungle Creatures line – I just love her stuff! Always colorful and filled with fun designs. So bright and cheery….love this! I always smile when I see another creation from the Lunchbox! I am visiting from Lets Bee Social-I am Kathy and I live in the Ozarks in Missouri. 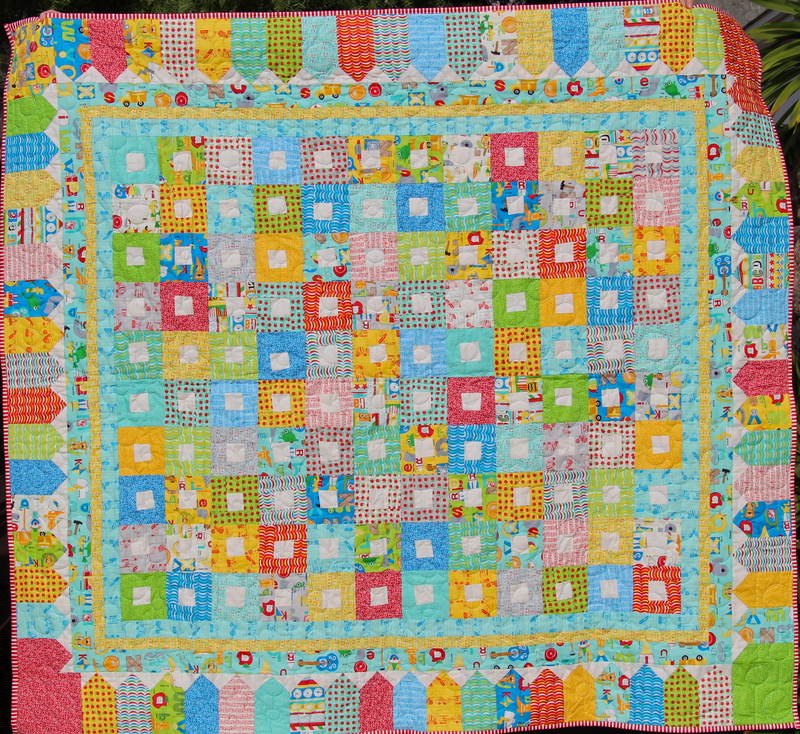 I love your quilt-the colors are so pleasing, looks like a perfect childs quilt too. These bundles are definitely a great way to buy a fabric line. I love them but my problem is that sometimes they look so god as a bundle I don’t want to break them open! What a cheerful and beautiful quilt! I love it. Thanks Lea! I really am addicted to fat quarter bundles right now 🙂 They’re just so fun to work with and look at! Hope you are having a wonderful day!